Remember the first time you ever heard of someone getting carpal tunnel syndrome? We’re sure you were surprised to learn how they got it: from typing! It was a rarely heard-of affliction mostly due to the insurgence of computers into our daily lives. With new technology, there can often be a learning curve, both in how to effectively use it, as well as how to utilize it in a healthy manner. 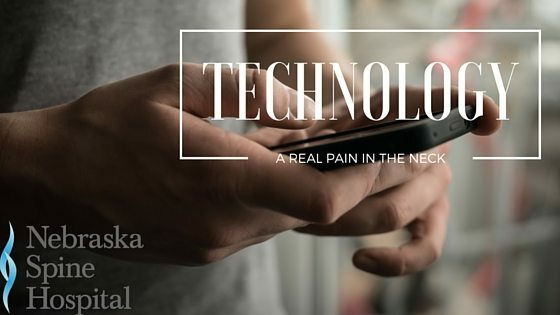 Recently, a new injury is causing pain for many tech users: Text-neck. The all-too-familiar scene: sitting at your desk or walking down the street, you’re hunched over your smartphone texting your friends about meeting for lunch. We hate to sound like a broken record, but: that is very poor posture. Often, your neck is craning your head over your phone and your shoulders are slouched forward. This stance can strain your muscles and cause pain and tension in your upper body and neck. Worse, bending your neck over your phone can actually put upwards of 50 pounds of excess strain on your spine. Holding this position repeatedly can lead to some headaches and at its most severe, disc injury and arthritic changes to your neck. Some people may even notice tingling and pain down their shoulders, arms and hands. If you are guilty of this texting posture, and hey, who isn’t, it’s time to implement some of these techniques to help prevent permanent injury to your neck and spine. Take note of how often you find your head, neck and shoulders in the hunched texting position. You will want to correct the posture to a healthier, more upright position. Look away from your screen every few minutes. This will remind you to sit upright and also has the added benefit of giving your eyes a break from the screen’s light. You might feel a little awkward at first, but it would be best to bring your phone up to eye level when you are reading an email or following directions. This position is much better for your neck and back, although, it will take some getting used to. If needed, when you are at a desk, you can get a phone or tablet holder to keep it at eye level. Beyond that, you can set some automatic reminders on your phone, say every 10 minutes, to let you know it is time to take a break and adjust your posture. There are great exercises and stretches that you can do daily. They are simple and can be done at home or at your desk. You can try the “Corner Stretch”, where you place your arms on the two walls where the corner meet and lean into the corner, or the “Levator Scapula Stretch”. You’ll want to read the detailed instructions on these stretches. If you want to go with a basic stretch, you can do a simple “chin tuck” where you pull your chin to your chest and hold it for a few seconds. If you can, ditch your smartphone as much as possible. If you don’t need it, don’t pull it out. Your neck will thank you. If you try these techniques and the pain in your neck, shoulders and back doesn’t subside, it might be time to seek professional help. You can Find a doctor with one of our specialists to talk about your neck pain.